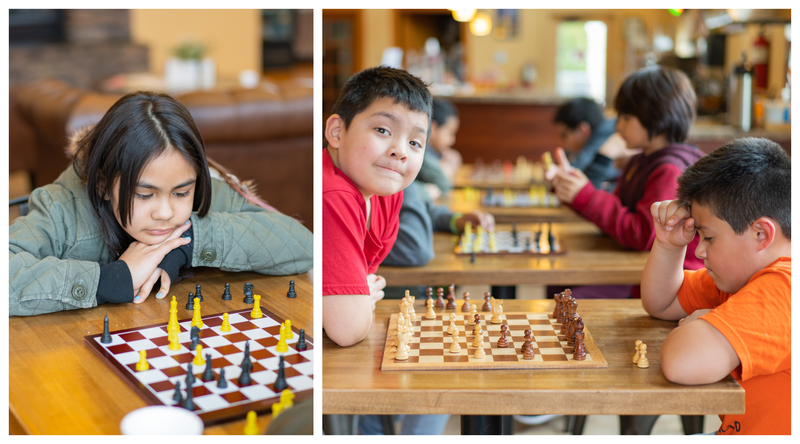 In recent days Caesar Mendoza, a 10-year-old boy from the Tierra Vida community has made a lot of noise around the Tri-Cities with his amazing Chess skills. He is a product of the evening program here at the Center for Sharing where he first started playing chess in 2017. Today his name can be heard in different parts of Washington and we at the Center for Sharing are extremely proud of his amazing transformation and accomplishments thereon. As the news about Caesar Mendoza has spread in the Tierra Vida community there is a noticeable excitement among the kids of his age. Its wonderful to see the passion in some of them. I felt it was the perfect timing to organize a chess Tournament for the kids at the Collegium Café. The kids were visibly excited and desperately wanted to win when they heard of the tournament. Therefore, on the 27th March 2019 we organized a chess tournament for the them at the Collegium Café. For a start we had a nice problem on hand. We expected eight kids and as things turned out we had Nine. We therefore had a knock out match and after getting the winner we moved into the main draw that started from the quarter finals. The kids appeared to be nervous and all of them were desperate to win. It was good to see how competitive they were, and their focus and concentration during the matches was commendable. It is always a huge challenge to organize a chess tournament for the kids. The youngest participant was only nine while the oldest was Thirteen. Tournaments of this nature create healthy competition amongst the kids who otherwise are seen spending relentless hours on their cell phones. The Collegium Café provides that perfect space for kids to invest their time in something meaningful and at the same time be entertained to the fullest. Like Caesar Mendoza lets hope these kids go on and achieve great heights in whatever they wish to pursue for the future. ← HOW REMARKABLE IS THIS?